So why have I been spending all this time researching the 1920s? 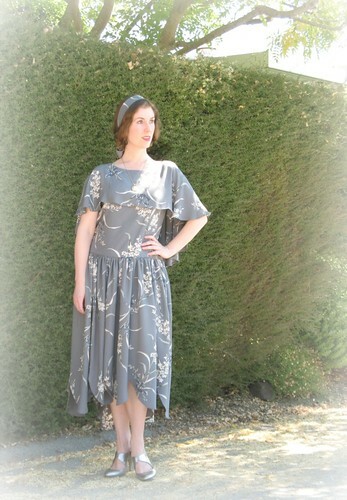 Well, the original impetus for heading back to 1928 was the most recent Sew Weekly Challenge. 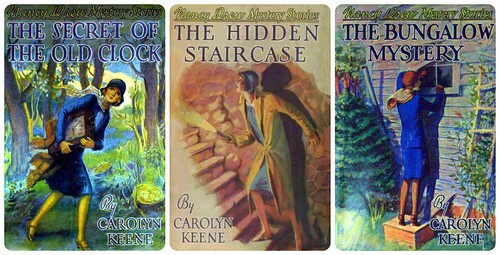 As I have previously mentioned, I love the old Nancy Drew books. 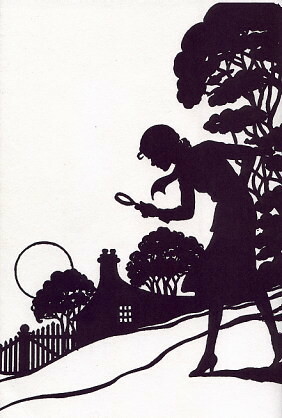 When I was looking for a little "Literary Inspiration," the famous girl detective seemed a great place to start. And with the books first published in 1930 and continuing until today, the possibilities were endless. My favorite illustrations from the series come from the 1940s (big surprise, I know! ), but since the idea is to challenge oneself, I thought something a bit different would be best. I figured that the 1928 silhouette would work perfectly for a story based in the year 1930. Nancy Drew is often pictured in the color blue (perhaps because it contrasted so well with her titan hair?). Unfortunately, I did not have any blue fabric with sufficient drape for this pattern. And I just knew that the garment was not going to work in a stiff cotton. What I ended up choosing was some rayon crepe that I have had in a drawer for over 10 years. In a perfect world, I would have made myself a matching cloche hat to complete the ensemble. A quick (read: lazy) substitution was a matching scarf. 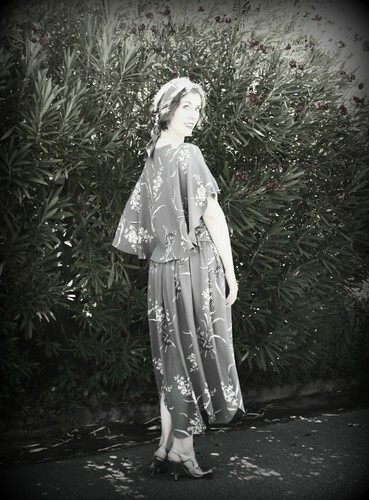 And now I am going to have to find a silk kimono so I can lounge around the apartment à la 1928. Oh my word, it turned out so incredibly spectacular! 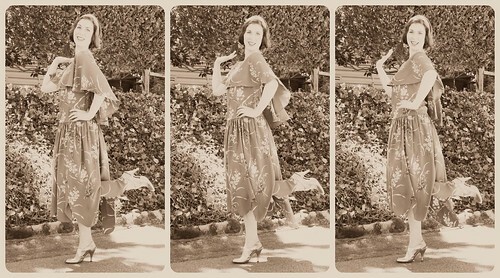 You look so gorgeous - and are proving once again that you can successfully pull off any decade you try. Laura Mae, this is such a beautiful creation. I wasn't sure how this one was going to work (would she look like a dowager? ), but it's lovely on you. And i love the print. Well done and one of my all-time favorites! Absolutely adorable! I confess, I never paid much attention to this pattern. It makes up MUCH better than the cover illustration. You look darling! First off, THIS IS AMAZING!! It is utterly perfect!! Fantastic job! Darling Girl, you have triumphed. Your election to President of the Wednesday Afternoon Ladies' Fine Arts League is assured. When you accept the Gavel of Office, may I suggest (just as an alternative of course) elbow length gloves in a soft dove grey or palest blush, opera length strand of pearls, and a suede cloche with a sweet scallop on the brim and trimmed with a cunning suede flower. You already possess the most perfect shoes any cobbler could devise. Dear me, I must stop now or risk becoming too specific in my maunderings. Toodle-oo! I love your hair like this! It looks awesome. Beautiful! 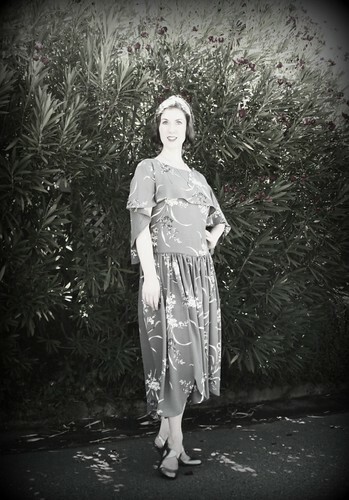 I love the 1920s look on you. Beautiful, beautiful dress. And Nancy Drew is great too. Very pretty print-it works perfectly for the dress and the dress looks really nice on you. Love the shoes too. It looks fabulous! 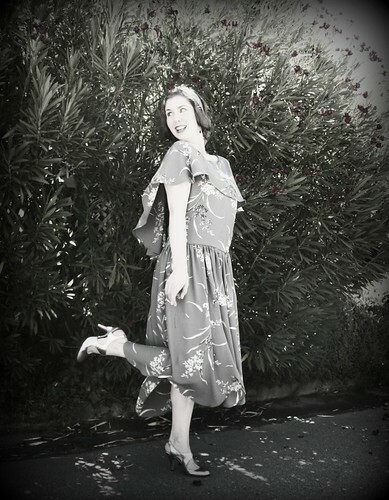 You simply must go to a 1920s party now, you'd be the bell of the ball. My sister and I adored the Nancy Drew book series. I think we read every copy that the school library had. Your dress is gorgeous! I like everything about it.